“The Old Man’s Little Brother,” from Barefoot Days and Sundown Songs, by Raymond Huse, illustrated with photographs by W.R. Spinney, Concord NH 1922. Internet Archive. New Hampshire’s Old Man may have fallen, but his younger brother still smiles upon the land. He has kept a lower, more reclusive profile. He was never keen on having people stare at him all day. He sits in a quiet, wooded location on Branch Hill in Milton, NH. The road used to be a busy stagecoach route, but with the advent of the railroad and the straightening of highways, it is now lonely. The profile is famous only to the local residents who put a photograph of “Sonny Jim,” as THEY call him, on the cover of their 2014 Town Report. I am told that he is visible from the road — Branch Hill Road — about 100 feet from the turnoff at Applebee Road. Once on Branch Hill Road, look for the “Land Share” sign, and just beyond it, on the left-hand side, you will see the profile from the road. The rock formation sits on private property, in a land trust, but as long as you are respectful, it is okay to get closer. Parking is difficult on this narrow hill road, so you may want to park at the bottom of Branch Hill Road and walk the short distance. (Please do not park in or block any private driveways or the main roadway). Don Stowell, whose family used to own the land on which Sonny Jim sits for several generations, says that the profile has been known since at least the Civil War days. The Milton librarian stated that according to local man, Raymond Huse, it was William Laskey who first glimpsed and brought attention to the rock formation. Another local landmark, Laskey’s Corner, is not far away, at the connection of Applebee Road and White Mountain Highway. The poem below is from the 1922 book, “Barefoot Days and Sundown Songs,” by Raymond Huse. The profile of a face. The “old man’s” little brother. Are parted in a grin. So that is why he smiles. My thanks to Betsey Baker of the Milton Public Library, Cynthia Wyatt of Branch Hill Farm, and Don Stowell for patiently answering my questions. New Hampshire’s Endicott Rock: Our Oldest Public Monument? 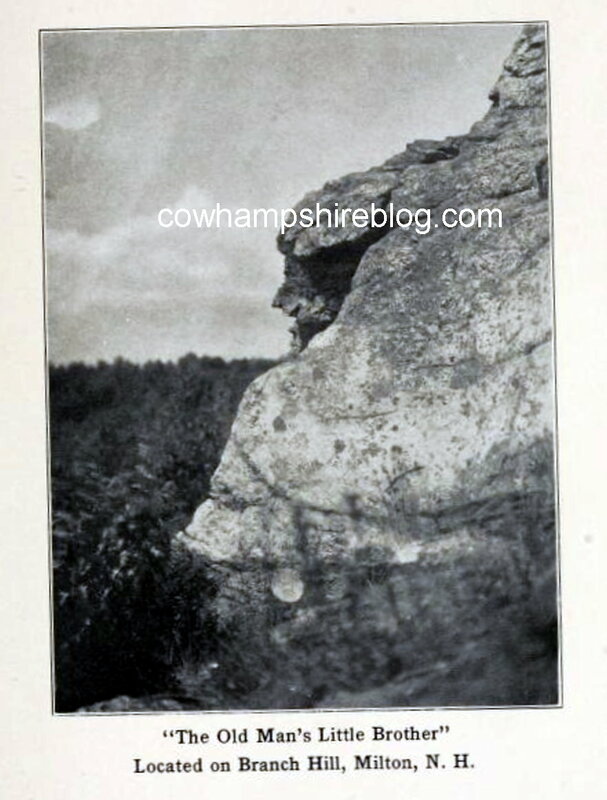 This entry was posted in Boulders and Profiles, History, Oddities, Accidents and Crazy Weather and tagged boulder, brother, face, formation, Hampshire, Hill, Hughes, Huse, Little, man, Milton, mountains, new, New Hampshire, NH, old, poem, poetry, profile, Raymond, rock. Bookmark the permalink. The Old Man’s Little Brother looks to be laughing to me. Great bit of local history.